Recent discoveries by a team of specialists and students at Huqoq in Israel’s Galilee, led by University of North Carolina at Chapel Hill professor Jodi Magness, shed new light on the life and culture of an ancient Jewish village. The discoveries indicate villagers flourished under early fifth century Christian rule, contradicting a widespread view that Jewish settlement in the region declined during that period. The large size and elaborate interior decoration of the Huqoq synagogue point to an unexpected level of prosperity. The first mosaics in the Huqoq synagogue were discovered by Magness’ team in 2012. 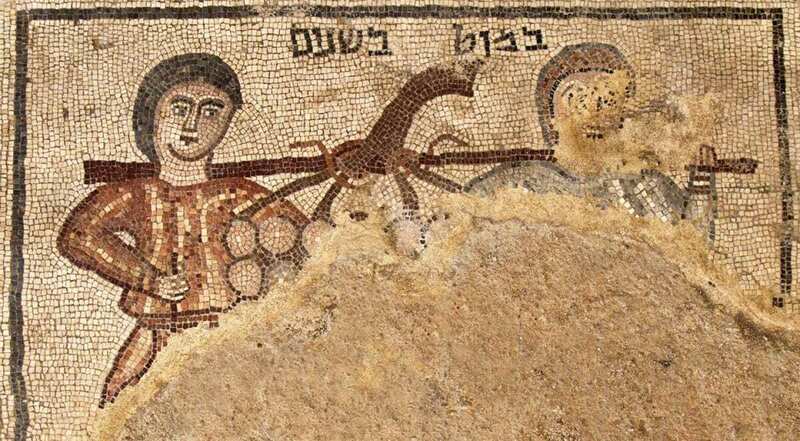 Since then, Magness, director of the Huqoq excavations and Kenan Distinguished Professor of Early Judaism in the department of religious studies in Carolina’s College of Arts & Sciences, assisted by Shua Kisilevitz of the Israel Antiquities Authority and Tel Aviv University have uncovered additional mosaics every summer. This year, the team’s specialists and students focused their efforts on a series of mosaic panels in the north aisle. Magness said this series is part of the richest, most diverse collection of mosaics ever found in an ancient synagogue. Along the north aisle, mosaics are divided into two rows of panels containing figures and objects with Hebrew inscriptions. One panel labeled “a pole between two” depicts a biblical scene from Numbers 13:23. The images show two spies sent by Moses to explore Canaan carrying a pole with a cluster of grapes. Another panel referencing Isaiah 11:6 includes the inscription “a small child shall lead them.” The panel shows a youth leading an animal on a rope. A fragmentary Hebrew inscription concluding with the phrase “Amen selah,” meaning “Amen forever,” was uncovered at the north end of the east aisle.